Prototype: Czech Railways (ČD) type Bmz 235 passenger car, 2nd class. Modernized Eurofima car, not pressure-proof. Model: The minimum radius for operation is 360 mm / 14-3/16". The car has an underbody specific to the car type. It also has Fiat type Y0270 S trucks with lateral motion shock absorbers and magnetic rail brakes. The 7319 current-conducting couplings or the 72021 current-conducting close couplers, the E73400/73401 lighting kits, the 73406 pickup shoe, and the 73407 marker light kit can be installed in the car. Length over the buffers approximately 28.2 cm / 11-1/8". DC wheelset E700580. Prototypical tooling change in the area of the doors. 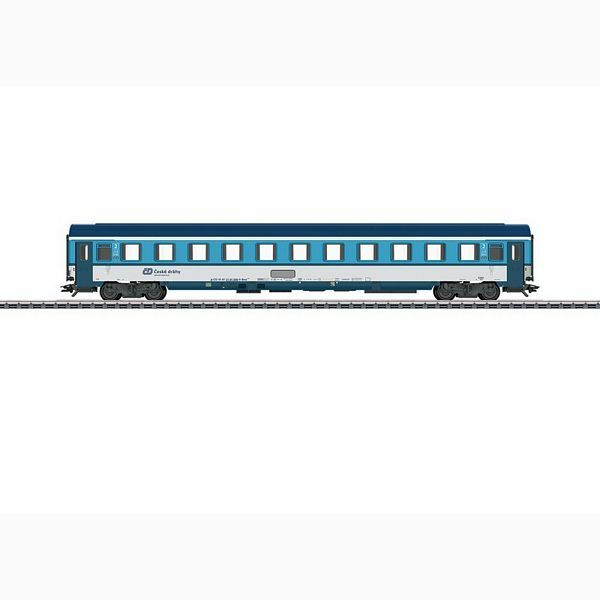 Passenger cars to go with this car can be found in the Märklin H0 assortment under item numbers 42746 and 43762. An electric locomotive to go with this car can be found in the Märklin H0 assortment under item number 36206. LED interior lighting can be installed.